Summit Lake in the summer. We are at the end of December and we haven't had snow in several weeks. Hikes this time of year without snowshoes or skis are normally out of the question, but I decided to check the trail conditions in just running attire. I chose this hike for several reasons. Most of the trail has a treeless southern exposure which tends to reduce the amount of snow on the ground. There is also plenty of unregulated winter parking at the trailhead. I wanted to see how hard it would be to get to the top of Donner Summit in late December. I began my hike at the Wendin Way access Trail off the Donner Lake interchange. 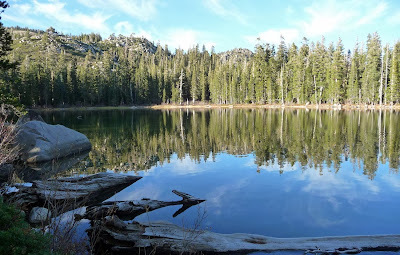 I use the word "hike", but my original intention was to run to Summit Lake and back. I began at 11:30am with one water bottle, one GU, and no cold weather gear to overheat me on the 3. 7 mile climb. The temperature was just below freezing so the trail was fully frozen and very runable at the beginning. Summer view of Donner Lake from the Donner Lake Rim Trail. I passed a group of hikers near the start that were properly dressed for the cold, used hiking poles, and carried day packs that probably had plenty of food, water and a cell phone. I passed them quickly in my running shorts and long sleeve shirt. The trail is well marked with signage and tracks in the snow. At mile 1.1 there is a sign that points left (west) to Summit Lake. 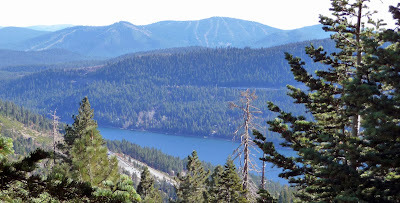 This is the Donner Lake Rim Trail that leads to Summit Lake and on to the Pacific Crest Trail. 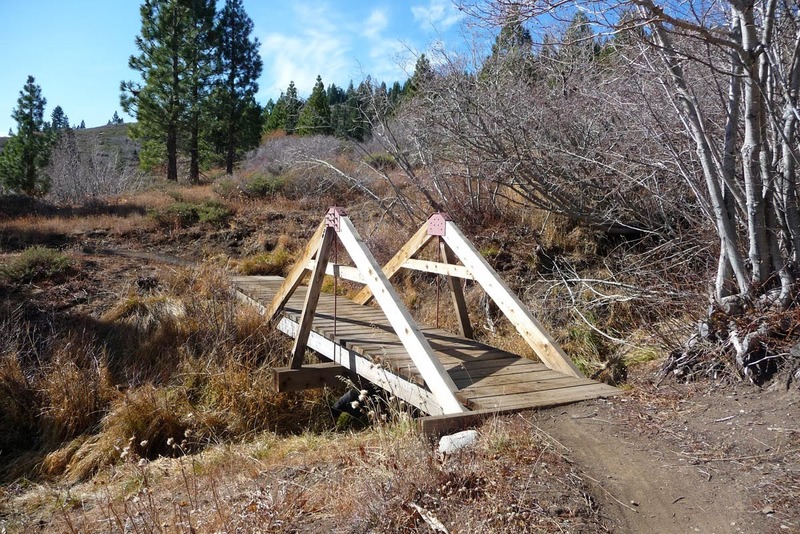 The Donner Lake Rim Trail provides access to the Hole in the Ground trail for mountain bikes and to Castle Peak for hikers. Summit Lake is a small lake less than a mile from the Donner Lake rest stop on Hwy. 80. This is a popular destination for summer "hikers" due to its proximity to the rest stop. However, when I was there on December 29th, the tracks in the snow suggested less than a dozen people had visited the lake in the past 3 weeks. The lake was completely frozen and covered with a blanket of snow. The only tracks across the lake were from a single deer. I was surprised to see the lake frozen, but the low angle of the sun and the tall lakeside trees are enough to keep the lake shaded most of the day. To get to the lake I had to walk a surprising amount of the time. The trail was 70% covered in snow that was either slippery or full of postholes from previous trail users. The downhill return trip required the same amount of walking through the snow. I was up and back in 2 hours. My water, food, and clothing proved to be just right for this winter hike/run. Check my GPS data and map for this 7.6 mile hike is on the Strava website. The trailhead is at 6,400 feet and Summit Lake is at 7,400 feet. Winter hikes above 7,400 feet would be more difficult even in this low snow year. Snowshoes should be carried at the higher elevations. Check the weather before you go and don't travel alone with minimalist gear like I do. If you are tired of running in Martis Valley or around Donner Lake, venture into the high country!